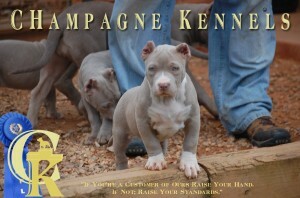 Welcome to Champagne Kennels! Proud exhibitors, fanciers, advocates, breed ambassadors and breeders of the American Pit Bull Terrier and the American Bully. 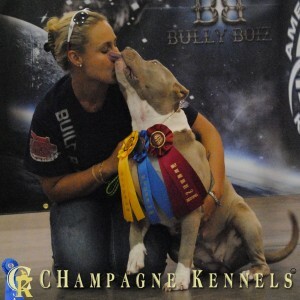 A husband and wife team whose passion, dedication to the breed, desire to have the best of the breed, and to compete at the top level of competition, evolved into a top notch kennel and breeding program back by over 20 years combined breed, training, showing and prestigious breeding experience. 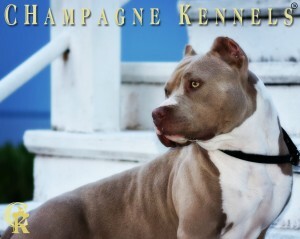 Our dogs are all UKC & ABKC registered and are transferable to many other top recognized Kennel Clubs. We do not consider our dogs for breeding stock until they have met a MINIMUM of the following: Champion titled in AT LEAST 2 different registries, holding AT LEAST 4 performance titles, has earned their Canine Good Citizen Certificate, and has been Health tested for hips, cardio and thyroid disease, has correct body structure, exemplary anatomy, with superior temperament and natural working ability, including outstanding genetic value. 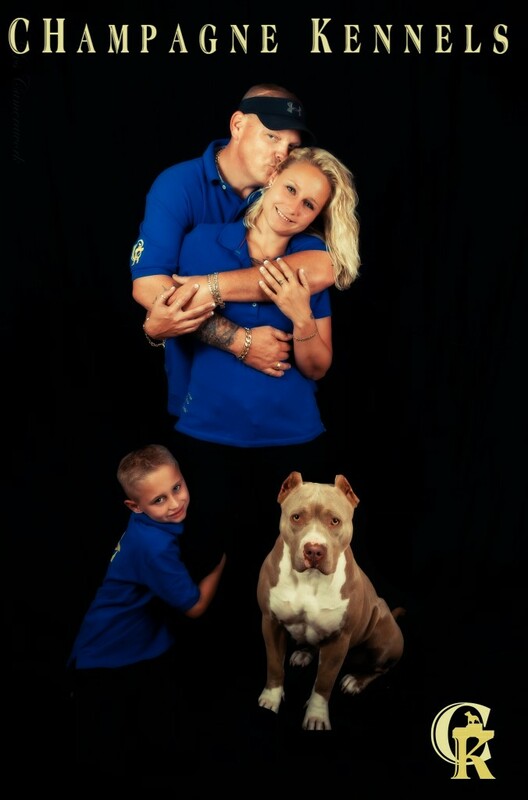 At Champagne Kennels, all of our XL Pitbull American Bully dogs are raised and kept indoors and treated with all the love and respect of family members. Our pure bred pitbull and XL American Bully puppies are raised in that same excellent family environment, encouraging the development of healthy stable characters and family oriented personalities. All dogs and puppies, must meet all phases of the sound temperament be “clear in the head”, and have that “family first” mentality that is quickly becoming “Champagne Kennels”, trademark and what people expect upon meeting any of our dogs or puppies. Breeding this magnificent breed is not a just hobby or a weekend adventure for us, it is our passion, a commitment of excellence, a dedication that our world revolves around, perfected with knowledge. As a reputable breeder we pride ourselves on offering you the best American Pit Bull puppy or American Bully puppy, you can possibly get! We believe in our breeding program, you should too! If you’re a customer of ours raise your hand, If not; raise your standards!